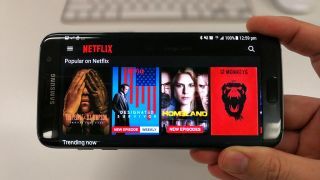 Netflix is considering creating mobile-specific versions of its original TV shows and movies to improve the viewing experience for people watching on phones and tablets. With many shows and films losing some of their impact when viewed on a tiny screen, the idea would be to create versions that offer alternate shots, scenes and framing in order to make the most of the device the content is being streamed on. Although the company hasn’t officially kicked this plan off, Hunt did add that “it’s something we will explore over the next few years”. The briefing was part of a two-day event at Dolby Laboratories and Netflix’s headquarters to celebrate their collaboration on the service’s latest original series, Marvel’s Iron Fist, which launches this weekend. While the idea of watching a big budget series or blockbuster film on a 5-inch screen may seem like heresy to cinephiles and TV junkies alike, it’s important to remember that outside of big territories like the US, UK and Australia, mobile streaming is where it’s at. According to Hunt, Netflix’s expansion to over 190 countries across the globe now means that “mobile screens are the majority consumption device”.